Safety isn’t a buzzword for us. Training professionals and technicians is our way to ensure that the safety standards for our industry is consistently high. All the rope access training courses that we offer are rigorous and are in line with the latest IRATA training guidelines and requirements. We have been a full member (trainer and operator) of IRATA, since May 2012. Industrial Rope Access Trade Association. IRATA was formed in the late 1980s, as the result of an initiative by a number of leading companies involved in industrial rope access techniques, to provide a safe working environment for the industry. IRATA, and its member companies, work to improve the industry’s safety standards, produce a set of standard guidelines and training requirements, and to provide a comprehensive assessment and registration process for operatives. Despite having over 200 member companies, the accident rates for IRATA members have been consistently below that of other industries. The rope access training courses are classed into Level 1, 2 or 3. Technicians are required to successfully complete a practical and theory assessment - before being allowed to work under their level of competence. In addition, Level 2 and 3 technicians must have worked for a minimum of 1000 hours. The hours must be logged by the employing company and recorded in the IRATA log book and should be signed by the attending certified IRATA Level 3 technicians or in the case of the IRATA L3 Supervisor by a client and/or the employing company. Level 1 technicians can perform some rope access tasks including inspections of all personal rope access equipment, assist in rigging and non-standard operations and undertake a rescue involving descent - under the supervision of an IRATA level 3 rope access technician. A level 2 technician can rig working ropes, undertake rescues and perform other tasks (under the supervision of IRATA level 3 rope access technicians). He will also understand some legislation, safety requirements and quality assurance procedures relating to rope access. A IRATA Level 3 technician can supervise rope access work projects onsite since he is aware of all relevant work techniques, advanced rescue techniques, the IRATA certification scheme, general requirements and guidelines. He will also have completed an emergency first aid training. Sumayani is the resident IRATA Rope Access Training Manager at DM NDT. 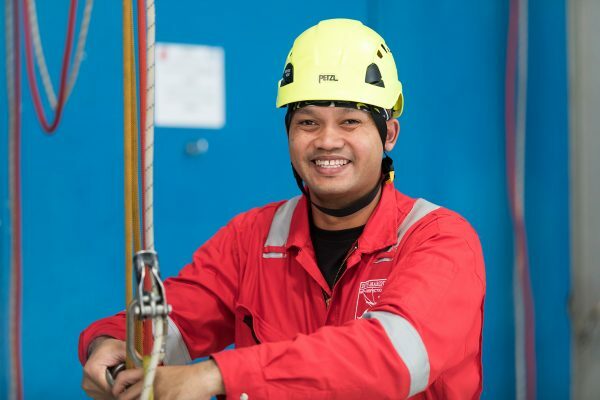 A certified non destructive testing (NDT) inspector and IRATA Level 3 rope access technician since 2012, Sumayani is, today, in charge of teach and training future IRATA rope access technicians. He obtained his Level 1 IRATA certification way back in 2006. He has traveled widely in pursuit of his career to different countries and continents. However, like many technicians in the field today, Sumayani started as a derrick builder and worked his way up. How do I register for these courses? Download our registration forms from here. Complete them and send it through to us either by email, post or in person. The costs of the courses differ based on the level and the course itself. We also offer a special rate for companies that register and pay for a minimum of three employees. Do you offer these training courses outside Singapore? Yes. We can conduct any of these training courses in other locations. We can also take into account requests and customize the courses to meet your requirements. Get in touch with us to discuss this in detail. How do I pay for these courses? Payments for our courses can be made in person, by cash or cheque and or by post. Please make sure that the cheques are made payable to ‘Dive Marine Rope Access”. When you register for the courses, we will issue an invoice with all the payment details. Once we have confirmed, accepted your registration and the payment has been received, your registration will be considered binding. How can I cancel/defer my registration? If you would like to cancel your registration, after the payment process, please write to us no less than 7 days prior to the course commencement date. We will not action any requests until we receive written notifications. Cancellations received in this manner will receive a full refund – after an administrative charge of SGD 150.00 has been deducted. We will not be able to accept any cancellation requests received less than 7 days before the course start date or after the course has started. Subsequently, we will not be able to issue any refunds. Who do I contact for more details about the course? Write to us on training@dmgroupservices.com for any questions about the course content. For all other enquiries about the course fees, logistics, enrolment, administration, etc please get in touch with us here.